Note: This article is technical. If you’re new to hair loss research, it’s best to start here. Do Any Hair Loss Theories Hold Water? When it comes to explaining why men and women lose their hair, no theory has all the answers. And while alternative hair loss theories get us closer to the answers, they still have holes. This is the theory of all hair loss theories. It’s touted by most doctors, surgeons, and researchers trying to quickly summarize why someone’s balding. Dihydrotestosterone, or DHT, is a hormone that comes from testosterone. DHT is higher in thinning regions of men’s scalps. As a result, many researchers say that DHT causes hair loss. For reasons not fully understood, hair loss begins when DHT starts accumulating in our scalps. Our hair follicles become sensitive to DHT, then begin shrinking. 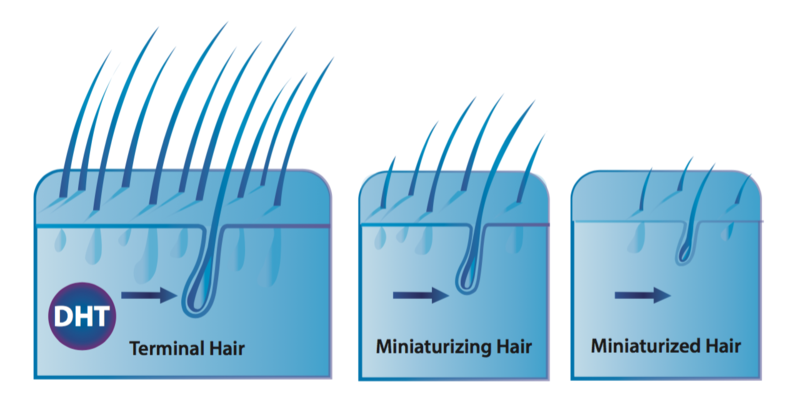 Over a series of hair cycles, DHT makes our hair thinner and wispier, until our hair becomes so thin that it disappears. The end result: pattern baldness. DHT is higher in the scalps of men with thinning hair. If a man is castrated, his testosterone and DHT levels plummet forever. Men castrated before puberty (ie: before their DHT levels spike) never go bald later in life. Some men have a rare genetic condition where they the lack an enzyme which converts testosterone into DHT in the scalp. Men who have this condition never lose their hair. That’s a very compelling case… Just look at the extremes. If we never make any DHT, we never go bald. And if DHT is too high in our scalps, we lose our hair. So what’s wrong with this theory? If DHT is the problem, then what causes DHT levels to rise in the first place? Why do our follicles become “sensitive” to DHT? How does DHT actually shrink our follicles? Why do men lose their hair in a horseshoe pattern, while women thin all over? Unfortunately, that’s not only unproven, it’s also misleading. DHT is just one of many factors associated with hair loss. It’s just one of several hormonal factors. It’s also just one of several biomarkers of a balding scalp – the others being arterial calcification, fibrosis, collagen remodeling, restricted blood flow, and a decreased subcutaneous fat layer. DHT in body and facial tissue encourages hair growth. DHT in scalp tissue discourages hair growth. Why? Another leading theory takes a stab at answering this. Why does tissue DHT encourage body hair growth and simultaneously discourage scalp hair growth? The theory’s answer is quite simple: gravity. One symptom of a balding scalp is an eroded subcutaneous fat layer. When we’re younger, our scalp’s subcutaneous fat is relatively equal on the sides and top of our scalp. But during pattern hair loss, the subcutaneous fat at the top of the scalp starts getting thinner and more eroded. Our heads are upright for most of the day, creating chronic pressure against the hair follicles and our scalp’s subcutaneous fat layer. At the start of puberty, men’s androgen levels surge (we get more testosterone and DHT). The Gravity Theory Of Baldness states that downward force + high androgens kickstart the erosion of subcutaneous fat in the scalp. For women, the theory states that high estrogen levels preserve the scalp’s subcutaneous fat layer – at least until menopause when estrogen levels plummet. According to the theory, this is why men start balding into early adulthood, and why women typically don’t lose their hair until later in life. How Does This Explain The DHT-Paradox? Well, DHT encourages body hair growth while also encouraging scalp hair loss. According to the Gravity Theory Of Baldness, DHT will only encourage hair loss if there is constant downward force at that skin site (aka: gravity). So, the top of men’s heads is under constant gravitational force. But their beards and body hair aren’t under the same force, because they’re angled differently. And that’s why men don’t go bald at the sides of the scalp or on their bodies or faces. Gravity’s force isn’t directly downward there, so the subcutaneous fat layer doesn’t erode in the presence of androgens like it does at the top of the scalp. Men’s scalps are protected against the downward forces of gravity until puberty, at which point testosterone levels increase and begin to erode the scalp’s subcutaneous fat layer. When this happens, our hair follicle’s subcutaneous “cushion” starts disappearing. The hair has to work harder to continue growing and survive. Since androgens encourage hair growth in other parts of the body, our body responds to the decrease in the scalp’s subcutaneous fat by sending more androgens there – in the form of DHT. DHT is supposed to encourage hair growth! But in an effort to encourage hair growth, DHT – a testosterone derivative – also erodes more of the scalp’s subcutaneous fat layer. The process continues until the subcutaneous fat layer nearly entirely dissipates, miniaturizing the hair follicle until it eventually turns dormant. Gravity, according to the author, explains why men only bald at the top of the scalp, and why DHT encourages body hair growth and scalp hair loss simultaneously. If this theory feels incomplete, it’s because it is. Problem #1: the theory doesn’t actually explain the “pattern” of male pattern hair loss. While the author explains why men lose hair at the top of the scalp, he doesn’t necessarily explain why the loss occurs in a pattern – or why men generally start thinning at the temples and vertex, then progresses from there. Problem #2: the Gravity Theory doesn’t explain why men bald differently than women. Males typically recede at the hairline and thin at the crown, but most women thin all over. How does the Gravity Theory explain women’s even thinning at the top and sides of the scalp? Technically, any thinning on the scalp sides refute this theory, or at least give evidence of another mechanism. Problem #3: like women, men can also lose hair at the sides of the scalp, not just at the top. Men in advanced stages of hair loss typically lose hair on the sides and even parts of their sideburns. According to the Gravity Theory, the subcutaneous tissue shouldn’t erode here because it’s not under the same chronic gravitational force. But in advanced stages, men and women definitely experience hair loss in these places. Problem #4: If this theory were 100% true, we’d also expect DHT to exert the same hair loss effect on other parts of our body that stay upright as long and as often as our heads. For example, our shoulders. 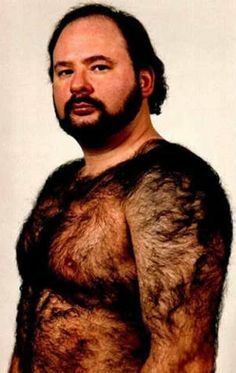 By the logic of the gravity theory, men should never get hairy shoulders. Why? The shoulders are on the same horizontal plane as the tops of our scalps. Our shoulders stay upright just about as long as the tops of our scalps, which means they’re under about the same gravitational pressure. And at puberty, we’d expect a surge in androgens and the degradation of subcutaneous fat tissue in our shoulders, which means we’d be hard pressed to find any guy who’s balding with hairy shoulders. Hairy shoulders are so common I could start naming friends of mine with them. As such, the Gravity Theory offers an incomplete explanation as to why DHT encourages hair growth and hair loss depending on the tissue. It doesn’t explain female pattern hair loss. And while the Gravity Theory might explain the relationship between a scalp’s decreased subcutaneous fat, increased DHT, and hair loss, it doesn’t come close to explaining the actual “pattern” of male pattern hair loss – or why recession and thinning starts at the temples and vertex. The third theory that offers an alternative explanation to the “pattern” of male pattern hair loss is The Skull Expansion Theory. The theory is as follows: we know that the bones of the human skull continue growing throughout adulthood. We also know – based on observations – that balding men typically have a different head shape than non-balding men. Their forehead has a bulge at the midline, and some would even say their entire heads are larger than the heads of those unaffected by hair loss. It turns out that DHT – which is elevated in balding scalp tissues – is also a hormone used by the body for bone remodeling. The Skull Expansion Theory argues, like the Gravity Theory, that the presence of DHT should encourage hair growth, not hair loss. But because DHT also encourages bone growth, then elevated DHT in the scalp also increases skull bone growth. This bone growth expands the size of the skull, and in doing so, moves the follicles further away from the capillary networks that supports them. The resulting reduction of blood flow leads to follicle miniaturization, and subsequently, hair loss. This theory is versatile in that it explains all the different patterns of hair loss for men. Skull bone growth at the front of the scalp leads to thinning at the temples. Skull bone growth at the back of the scalp leads to thinning at the vertex. If you take a walk around town, you can see for yourself the evidence of the skull expansion theory. Men who are receding at the temples typically have a bulge at the front of their scalp. If you’re suffering from pattern hair loss and you have older photos of yourself, you might even notice the development of this bulge as you began to thin over the years. The first problem with the Skull Expansion Theory is that there are some men who clearly have experienced skull expansion, but also minimal or no hair loss. This is evident when we look specific cases of frontal bossing — or when the brow line begins to protrude far beyond the forehead. Not all people with frontal bossing or forehead protrusion experience hair loss. Moreover, frontal bossing and severe forms of skull expansion are often the result of excessive growth hormone release – sometimes due to a tumor in the pituitary gland. In some cases, the release can be so excessive and so chronic that a person’s hands, feet, face, head, and body continue to grow throughout adulthood. 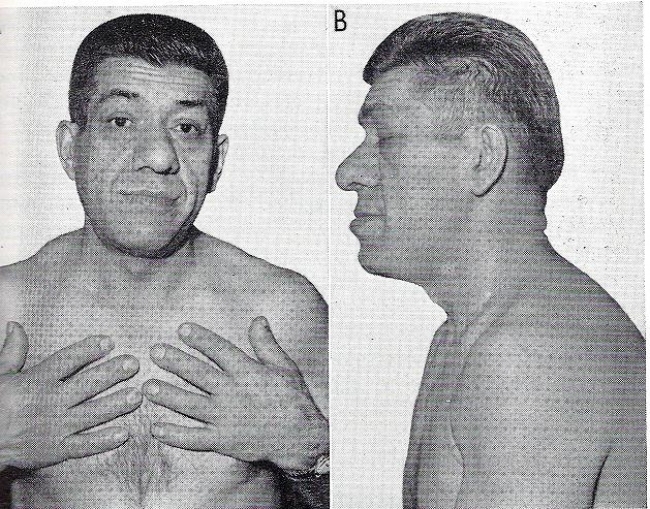 This is called Acromegaly. 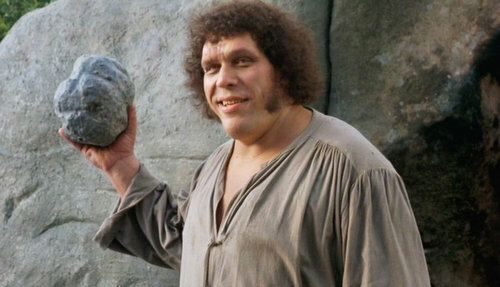 Andre The Giant had the condition, but despite his bone growth, he also had pretty good hair. There are also cases of men whose skulls haven’t expanded much but have still gone bald. Take Kelly Slater at 19-years old and then in his forties. His scalp is very well rounded – there’s no frontal bossing, and minimal (if any) expansion on the sides of his scalp. It looks as if he just shaved his head. He did. But during that period, he also lost a lot of hair. The second problem is that the Skull Expansion Theory, like the Gravity Theory, doesn’t fully explain the difference in male versus female pattern hair loss, or why women typically thin evenly everywhere while men thin at the temples and vertex first. With that said, I believe in the association between a bigger head and a balding scalp. Skull expansion is definitely a factor in many pattern hair loss cases. The theory deserves more attention and more research, and its author, Paul Taylor, deserves significant recognition for putting out an idea with more merit than, in my opinion, nearly every other theory. But as far as the skull expansion causing hair loss — I think this has still yet to be proven. Which brings us to the last and most specific theory of all. There are a few iterations of the tight galea and muscular tension theories of pattern hair loss, and I believe these theories – while still incomplete – take us closer than any other in addressing all the studied conditions of a balding scalp. Here are the basic principles behind the theories. If you’re interested in learning more for yourself, I encourage you to read this, this, and this. Each of those articles is worth your time. In fact, those findings are why I recommend spending so much time massaging the sides, nape, and sutures of your scalp – and not just your thinning areas. The theory is as follows: the parts of the scalp predominantly affected by male pattern baldness are all above the galea. The galea is a fibrous tissue that rests over the entire top of the scalp. It’s a connective tissue that links the muscles above your eyebrow (frontalis) and the muscles behind your ears (occipitalis). 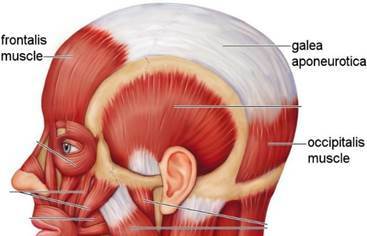 There are no muscles on the top of your scalp – just the tendon-like fibrous tissue known as the galea. For men, the areas of the galea aren’t really affected by hair loss. It’s just the hair residing over the galea that tends to disappear. So the question is, why? It turns out that balding scalp tissue actually fuses to the galea. In balding sites, the top three layers fuse together – the skin, subcutaneous fat, and the galea – creating one large, inseparable, fibrotic-ridden unit. It’s important to note this fusing is unique to balding sites. It doesn’t happen in non-balding areas or at the hair sites on the sides or backs of our heads. This fusing results in an increased presence of fibrotic tissue, a decrease in scalp skin elasticity, a decrease in the density of the scalp’s subcutaneous fat, and finally, hair loss. What causes the galea to fuse to the top two layers of our scalps? One idea is that androgens drive greater muscular development, and due to higher androgen levels, men tend to have larger developed muscles surrounding the galea. These muscles are difficult to fully relax. As a result, the muscles are often in contraction and chronically “pulling” on the galea, thereby tightening it. A galea pulled tight by chronically contracted muscles restricts blood flow to the galea, and in doing so, reduces nutrient flow and oxygen levels of tissues supporting the hair follicles. Over sustained periods, a reduction in tissue oxygen levels can result in chronic low-grade inflammation, which eventually culminates into the development of fibrotic tissue – the same tissue that fuses together the top three layers of the scalp. Interestingly, the areas where scalp tension is greatest are the vertex and the temples, meaning these areas should be the first to suffer from hypoxia, and the first to go bald. This idea has existed for years and was partially validated by a study about Botox and hair loss – where Botox was injected at the scalp’s side and back muscles surrounding the galea to disable their movement. The six month results were a reduction in muscle size, a more relaxed galea, modest hair thickening, and partial hair regrowth. This idea makes sense for men, but it doesn’t explain the different patterns in male versus female pattern hair baldness. We’re back to the Skull Expansion Theory. Androgens increase at puberty and drive, among other things, bone growth. For the most part, our skull bones continue developing throughout our adult lives – and part of this skull bone growth is mediated by DHT. As the skull bones grow, they increase the tension against the galea and its surrounding muscles, which restricts blood flow and reduces oxygen tissue levels (also known as hypoxia), which causes chronic inflammation that eventually culminates in fibrotic fusing of the skin, subcutaneous fat, and galea. The same shortcomings as before. This theory gets us very close, but there are still cases of skull expansion without hair loss and little to no skull expansion with hair loss that challenge its completeness. This theory also doesn’t explain the difference in male versus female pattern hair loss – why women thin all over and men thin in a horseshoe-shaped pattern. The final idea is that the galea fuses with the scalp’s top two layers because of an increase in scalp androgen sensitivity mediated through mechanical force. This one is a mouthful, so bear with me. We know that androgens, like DHT, play a role in pattern hair loss because men who are castrated before puberty have very low levels of DHT and don’t go bald later in life. We also know that tissue DHT levels are higher in balding versus non-balding parts of the scalp. This is why people associate DHT with hair loss. There’s definitely a relationship, but whether DHT is the cause of hair loss is still debated (as evidenced above). In any case, this phenomenon begs the question: why do tissue DHT levels increase only in balding areas, and not everywhere in the scalp? Some researchers believe DHT levels are higher in balding regions because of an idea known as “enhanced androgen sensitivity.” And here comes the mouthful. In order for DHT to accumulate in the scalp, DHT needs to attach itself to a receptor site. These receptor sites are known as androgen receptors. Androgen receptors are located inside our cells. When DHT attaches to a cell’s androgen receptor, that DHT molecule will influence that cell’s functionality. For example, in certain facial and body tissue cells, DHT appears to influence cell function by encouraging hair growth. But for cells surrounding the hair above the galea, DHT appears to encourage hair loss. How can that be? How can the same hormone encourage both hair growth and hair loss, with the only difference being body location? It turns out that DHT molecules aren’t the only thing that influences a cell’s function. Certain proteins can also change cell behavior. These proteins are called androgen receptor “coactivators.” These coactivators interact with androgen receptors – the place where DHT binds – and “enhance” the androgen receptor’s function. In other words, these protein “coactivators” increase a cell’s sensitivity to androgens. One of these coactivators is called Hic-5 / ARA55. This coactivator is highly active in beard tissues and in balding tissues of the scalp, but not so active in non-balding parts of the scalp like the back of the head. This is important. In tissues with elevated DHT (the tissues that grow facial hair and the tissues in bald parts of the scalp), this protein coactivator is also higher. Some research suggests that this very coactivator regulates androgen sensitivity in human hair follicles. To put it bluntly, if a cell expresses the Hic-5 / ARA55 coactivator, you can bet that DHT will bind to it. According to the theory, this is why some tissues accumulate DHT and others don’t. At puberty, the Hic-5 / ARA55 coactivator increases in facial, body, and scalp tissues above the galea. As a result, more DHT binds to those cells’ androgen receptors. Paradoxically, in the scalp, more DHT leads to hair loss. In the face and body, more DHT leads to hair growth. But why? If an increase in Hic-5 / ARA55 explains why certain tissues start accumulating more DHT, then why does an increase in DHT cause hair loss at the scalp but hair growth in the body? This is where the mechanical force element comes in. The Hic-5 / ARA55 coactivator is activated by both androgens and mechanical force — specifically, stretching tension, the kind of tension occurring naturally in the galea. It also turns out that increased DHT in the scalp also stimulates something called transforming growth factor beta 1 (TFG-β1). TFG-β1 is a signaling protein, and when it’s overexpressed, it leads to perifollicular fibrosis – or scarring surrounding the hair shaft that miniaturizes the hair and leads to hair loss. Chronically elevated levels of TFG-β1 are suspected to cause the fibrotic fusing we observe in the top three layers of balding scalps. At puberty, an increase in androgens stimulates the expression of Hic-5 / ARA55 coactivators in body, facial, and certain scalp sites. This coactivator makes a cell’s androgen receptor more “sensitive” to DHT – and thereby more likely for DHT to bind to it. More DHT binds to androgen receptors in body, facial, and scalp tissues… But in the scalp tissues, more DHT also leads to an overexpression of TFG-β1. Above the galea, the overexpression of TFG-β1 results in perifollicular fibrosis. The hair follicles begin to miniaturize, and over time, this fibrosis begins to fuse together the top three layers of the scalp – the skin, the subcutaneous fat, and the galea. This “fusion” creates more mechanical tension, especially at the the vertex and temples, and that tension encourages an even higher expression of the Hic-5 / ARA55 coactivator. The more Hic-5 / ARA55, the more DHT, the more TFG-β1, the more perifollicular fibrosis, the greater the galea fibrotic fusion, and the more hair you lose… until the entire galea is fused with the top three scalp tissue layers. The theory’s argument that TFG-β1 increases more in the scalp than other body sites is unfounded. TFG-β1 is a signaling protein. It’s used in tissues all over the body for processes ranging from inflammatory responses to cell proliferation. While there’s evidence to suggest TFG-β1 inhibits hair growth, I’ve never seen anything that says TFG-β1 is higher in balding scalps than body or facial tissues that bear hair. That needs to be true for the theory to hold. But for now, this statement is just conjecture. The theory doesn’t explain why, at puberty, androgens stimulate the expression of Hic-5 / ARA55 in soon-to-be hair bearing body and facial tissues, on scalp tissue above the galea where hair is already present, but not on hair-bearing sites on the sides of the scalp. The theory says this coactivator over-expresses above the galea because of the mechanical tension already naturally occurring in the galea… But if this is the reason why the coactivator expresses itself above the galea but not on the sides of the head, then is there also similar tension at every other hair site on the body and face? Here we have a chicken-and-egg problem. Which came first: the tension or the Hic-5 / ARA55 coactivator? And even ignoring this, the theory still doesn’t explain the mechanism behind which androgens activate the Hic-5 / ARA55 coactivator. Basically, the theory consists of a lot of unproven assumptions. This theory doesn’t explain the different patterns in male and female pattern hair loss! Again, these theories don’t explain the different balding patterns in men versus women. They only explain pattern hair loss for men. In fact, I haven’t come across an alternative or mainstream theory that addresses these differences. It’s a question we’ve yet to answer. Otherwise, I tend to agree with the scalp tension and galea theories of hair loss more than others. Scalp tightness and chronic muscular tension can lead to the chronic inflammation that results in the calcification-fibrosis cascade of hair loss. Which Hair Loss Theory Do I Believe? I don’t adhere to any specific theory. I think the Gravity Theory, Skull Expansion Theory, and Muscular Tension / Tight Galea Theory all have their flaws and merits. Each theory is capable of explaining most, but not all, of the pattern in the context of male pattern hair loss’ symptoms. None do a perfect job at explaining why women bald in a different pattern than men. None of these theories accurately address the DHT paradox – why DHT encourages body and facial hair growth but discourages scalp hair growth. None of these theories truly take into account the relationship between increased DHT, androgen receptors, imbalanced calcification regulators, and the very strong evidence that calcification and fibrosis precede hair loss by choking the follicles of proper blood, oxygen, and nutrient supply. What can we glean from all of this? We need to do more research. …then I think those answers will take us closer to a universal cure. Until then, I believe the best (and safest) hair loss solutions are to target calcification and fibrosis. Different person has different sensitivity of skin follicles to testosterone (or DHT), that’s why some people are hairy, some dont. When we get older and older, the skin follicles become more and more sensitive to testosterone (or DHT), that’s why the older we are, the more body hair, the more beard, the more hair loss. thanks for your detailed outline of different theories about Male pattern baldness, It’s eye-openning. Have anyone 100% checked this? castrated men were scarce, maybe they happened to be those who would not go bald even not castrated? Do we need widely castrated men to verify the thoery? Given that relationship, and that DHT is made from testosterone, I’d say that the observational papers suggesting castrated men before puberty never go bald probably hold validity. We could always benefit from deeper analysis and more data, but in general, I think (for now) that relationship is pretty clear. how can I get full paper from this ncbi website? You can either buy the paper or access it through a university. I saw ad in youtube about Gofybr-get your hair back in seconds. Do you think this is another snake oil product? If the ad were for getting your hair back in seconds, my guess is that it’s an ad for a topical product that masks thinning hair – like Toppik or Caboki hair fibers. These aren’t necessarily scams – they’re just aesthetic masks to the problem. They don’t regrow your hair, but they certainly give your existing hair a fuller, thicker appearance. Rob, what do you think about the role of genetics? Do some people, because of their genome, develop easily fibrosis or calcification? Because it’s clear in my opinion that even if the gene expression is influenced by diet and environment, there are some people more at risk of hairloss because of genetics. Genetics definitely play a part. While the completion of the Human Genome Project showed that genes don’t determine our destiny – and that gene expression likely plays a large role in disease development – that’s not to say that hair loss isn’t at least partially genetically driven. I got a 23andMe test to see how genetically predisposed I was to hair loss. It turns out I have pretty much all of the genes linked to baldness – including the worst ones mapped (polymorphisms to the androgen receptors that increase my chances for baldness 7x). So I agree with your statement. And to add to it, I think that certain people (like myself) have to work harder to overcome any genetic disadvantages. What do you mean by “have to work harder to overcome any genetic disadvantages”. What can we do to overcome. Typically, you likely have to overcome 1) inflammation from galea aponeurotica-transmitted skin tension, mediated by either skull bone growth or chronic contraction of the muscles connected to the galea, and 2) your body’s response to that inflammation (DHT and transforming growth factor beta 1). Any anti-androgen targets the second half of the equation (ie: finasteride, spironolactone). But the first half is more complicated, and typically requires the work of mechanical stimulation exercises (massing, dermarolling, botox injections into GA-connected muscles, acupucunture) to either create more scalp laxity, remodel tissues, or both. what do you mean by “chronic muscular tension”? You once told me in the comments of this website that you experimented Tom Hagerty’s scalp exercise, which needs the alternate contraction of the scalp muscles. Is that a different thing? In my actual regime I regularly do that exercise and I hope it’s not damaging my hair, although it doesn’t seem so. The theory is that the muscles surrounding the galea pull the galea tight and limit blood flow, oxygen, and nutrients required to support the follicles. If you subscribe to this theory, then around puberty our androgens spike and kickstart the development of more defined muscles – including the muscles surrounding the galea. The theory states that due to head shape (and even natural posture), some men subconsciously keep these muscles contracted – which over a series of years leads to hair loss as a result of the constricted blood, O2, and nutrient supply. The theory behind the Tom Hagerty exercises is that they allegedly help us to “relax” those muscles that are otherwise in chronic contraction. In doing so, you might restore some blood flow to the hair follicles above the galea and thereby O2 and nutrients as well. Once you gain control of those muscles, you can make a conscious effort to keep them loose throughout the day. I remember when I was younger my scalp skin was more “fat” i remember my hairdresser said i not have stress but now my scalp in top very thigh. I dont have still stress but i can not think why that has happened my head is not big… also i remember i had more oily head and forehead now i feel just dry and my hair feels dry too…how explain that? I think it has something to do with my thinning hair in top….just wondering. Also When i do scalp massage my scalp gets very dry and my head full of white dead skin… what i do wrong? Hey Joona – the erosion of subcutaneous fat is often closely linked with an increase in androgens (testosterone and/or DHT). At least, that’s the current leading theory. Changes to sebum production (the oil to which you’re referring) can manifest in a lot of ways – diet, environment, lifestyle, stress, etc. Accutane is a drug that targets acne reduction by shrinking the sebaceous glands (which produce sebum), and it’s essentially high dose retinol (a form of vitamin A). So vitamin A has been shown to modulate sebum, but there’s just a million other reasons so it’s tough to give you a concrete answer without more information. Regarding the massages — I don’t know if you’re doing anything wrong. Dandruff is a commonly reported side effect and it often doesn’t indicate anything negative. Dandruff? This is interesting. I had a bout with Seborrheic Dermatitis last summer. My hair was falling out clumps and my scalp was dry and crusty. Here is what is interesting. You talk about the microbioderm. I believe the indigenous scalp yeast may impact inflammation. Why? I went to a dermatologist and he gave me Clobetasol 0.05% Top Soln and Nizoral shampoo. I used these and also bought a zinc base shampoo and another S.A./Sulfur 2.5% combo product. I alternate these daily. My hair stopped falling out and appears much thicker than last summer. I would propose anyone losing their hair may benefit with aforementioned. I leave the shampoos on the scalp for 10 minutes. Theory? As I said, inflammation reduced with the topical corticosteroid and anti dandruff shampoos kill the scalp yeast (Malasseria) a fungus and thus reduce inflammation. There might not be a good theory for what I do but in practice it works for me. So, I agree that a topical anti-fungal, or an anti-fungal shampoo like Nizoral might help! You mention commonalities between between scleroderma and MPB. So, there is a protein called TLR4 which reacts with endotoxin secreted by gram negative bacteria in our gut. Guess what antagonizes TLR4 in humans – 5AR derieved steroids. So, there might exist a positive feedback loop where upregulated TLR4 causes DHT buildup and the cycle continues ? This points out to the gut microbiome imbalance. This might explain why Danny/Peat insists on taking antibiotics . May be you can explore more on this TLR4 and 5AR connection. Dante – incredible find. And thank you for sharing it with me. I’m going to look into this right away. One question – could you pass along the information about 5-AR derived steroids being antagonistic to TLR4? If true, your hypothesis about a feedback loop has a lot of merit. As far as antibiotics – I’m on the fence, but I understand why Ray Peat sometimes recommends them. Another approach might be reintroducing bacteria that compete with TLR4-promoting microbes. As I learn more I’ll continue to share with you. And thanks again for passing this along! search about tlr4 and 5AR on the raypeat forum. You will find more on the benefits of 5AR there than probably anywhere else. If this hypothesis has any merits, then you should check out L Plantarum, that has been proved to work as an effective Probiotic against Sepsis. There is sufficient literature w.r.t L Plantarum and TLR4. The DHT is like a fertilizer for hair, yes. As the scalp/galea is under tension, the DHT level increases, also due to a cyclic effect of inflammation. This DHT simply boost the growth of the Hair, and too much over the Galea resulting in an excess of stimulation : the follicle shrinks because of too much growth rate, tired. That’s simple and obvious but not easy to counteract. The root cause is : calcification of blood vessels, resulting in less feedings to capilaries ends, thus brown adipose reduce, thus galea+skin creates tension, that reduce blood flow and increase DHT level (not washed out). An organ that is not used, shrink. Scalp must be stimulated (motion, running, cold exposure) and we should eat much less Calcium from Milk and Diaries, also because it perturbates our Gut equilibrium, and lessen the amount of Omega3 manufactured by our microbiots. Thanks for all the work in summarizing all we know and (that we don’t) about hair-loss. Appreciate that you still leave the door open to that one elusive theory of everything about hair-loss. 1. How come transplanted hair form (back/side areas of scalp) are able to continue growing unaffected by those same factors that caused balding in the vertex and crowning areas? Or has that claim by hair surgeons never been tested? 2. The blanket reason is almost always genetics or “everyone is different” but I would add one more to the list of things the theories presented above fail to explain and it is quite simply: within males, why do some men bald whereas others don’t ever given similar/normal levels of androgenic hormones? If you have follow-ups, please let me know. I’ll get back to you as soon as I can. But I’ve never dug into the issue too deeply. The main challenge is relating posture to the pattern of hair loss for most men, and how that differs from the pattern of hair loss for most women. If you have any insights, I’d love to read them! I have to say, your website is the most comprehensive source of information I’ve ever read relating to hair loss. Thank you for this. in this light, is that they need to decrease their intake of dietary calcium. endogenous cholesterol levels. Probably even less. K2, is the most powerful calcification antagonist known to researchers. Moral of the story: get sufficient vitamin K via your diet. However, this story is not over yet. Thanks for the comments and for reaching out. I edited your comment slightly — I only reduced the quoted portion from Chris Walken’s book to avoid copyright infringement on my own site. One thing I will mention: I do believe that DHT plays a causal role in hair loss, but that DHT alone doesn’t cause hair loss. That’s the big point of differentiation between Walken’s theories and mine (I substantiate the DHT-fibrosis-calcification connection in the above article). I agree with Walken’s nutritional recommendations, but I’m starting to change my tune on certain polyunsaturated fats (like linoleic acid). I’ll write an article on that soon. If you’ve already applied for the patent, we’d be curious to hear your take on the research, your own theories on the causes of pattern hair loss, and the treatment system you’ve outlined. I was checking the other day some forums and came up with the “Chinese Cupping” method. Apparently there is no science behind it but there are some people advocating that it can help break the calcification and probably fibrosis. It’s a bit strange all the coagulated blood that is extracted, no idea what to think! Thanks for the link. My hesitations with recommending cupping to readers is that there’s not much research on its efficacy for inflammation reduction. That’s not to say it won’t help — it’s just that I like to make recommendations grounded in scientific studies, and I haven’t found a strong enough case for cupping to do so. I’ve communicated with two readers who’ve tried cupping, and one who firmly believed it was helping his hair. If you decide to start cupping, please keep us posted with your results! I retain that there is still this ‘believe’ or understanding that DHT can discourage scalp hair growth. – DHT is not limiting or avoiding the Hair to growth or the follicle to reduce it’s production of the Hair. Actually DHT is INCREASING the RATE of growth, again it is acting as a strong hair growth stimulator (4x time stronger than testosterone itself). Therefore when the DHT is present in EXCESS (or in great amount) the Follicle is entering in a BOOST mode and the hair a growing faster. Does anybody forget to remember that his 20 years head of hairs ? I remember that I had to go for a hair cut very frequently, and I would say ‘more than when I way 10years old for sure, and I was one of those at school who had to go frequently compared to others !.. That’s what I remember and this gave me today an idea that DHT was high in my scalp and booster my hair follicles. Boosted until a point that, with my view today I would consider abnormal, and i would suspect that at this time, my Follicles were somehow calling for more DHT (increasing the Androgenic receptors). Why ?.. I found in Nature review the answer : if you private artificially follicles from the adequate amount of oxygen and nutriment for their energy (and remember also that follicles act individually)then you start to see a cascade of signaling proteins, androgen receptors sensitivity increasing and so on and so on, exactly as observed in the Scalp of bald areas, including the explanation of calcification and fibrosis as you describe it in a perfect way Rob, making the problem even more hard to reverse. It means that I was already stressing my Follicles at teen age until 20-25 years until I started to see hair sheading effect. The stress was too few oxygen to my scalp. Why and how ? I don’ know. –> Rot, it is here that I would like your support : what can triggers to someone this vicious circle with 1st oxygen privation for some ones and not to other people ? .. or at least later, because let’s remember that hair loss affect a % of men equal to decades or peoples age. I personally noticed today the importance of stress and how one live the stress internaly (how he react with his hormons, can be seen in his daily behavior such as how fast he react and overreact sometimes to a situation) This part is of course genetically predisposed for a %. I remember that this period of life can be quite stressing and scalp/galea tension + not a perfect(far from it) hair/sclap condition (due to few money and awareness of the importance to take care of the scalp with right shampoo and so on). 1- DHT paradox for me is SOLVED, is a hair growth stimulator everywhere in the body. 2- in the scalp clearly mechanical tension, stress, oxygen privation by a certain way leads to an overstimulation of follicles and overproduction of hair, leading to a exhausted follicles (miniaturization) and this can also explain why not all hair follicles react in the same way and probably why woman and men have different pattern because Oestrogens in women protect them (to a certain extent) to this excess of stimulation, keep the Scalp skin thick (subcutaneous fat) and thus the symptomatic effect pattern (usually revealed later then for men and for sure at menopause) reflect a diffuse thinning on top of head = an average cumulated medium overstimulation+fibrosis stage different, while mens suffers rapidly in the highly stressing regions (from a mechanical point of few for blood flow and oxygen delivery) that is the famous MPB in horse shoo. That said, we have first to fight fibrosis and calcification, that’s crystal clear today. Many Thanks Rob for all the work you have done to convince and explain this to everybody. Reducing DHT topical is only a intermediate factor, how can we help follicles to avoid calling for it ? and find the right amount of oxygen in the scalp ? especially over the Galea where the tension is higher for blood (capillaries by the way) to flow at the right pressure. – lack of sport, stressing life (studies, girls, future, else..) :)..
– lack of motion of the scalp by voluntary muscles ? Thank you in advance for your answer, I am really pleased to exchange with you, and If my view and experience can bring something to the community I would be happy of course. Thanks for reaching out. I think your ideas echo a lot of what the article says — and are almost a hybrid between the galea theory of hair loss, and the gravity theory of hair loss. It’s certainly possible that DHT promotes hair growth everywhere, but that DHT in the presence of several other variables may negate hair growth as a result of DHT’s pathology to calcification and fibrosis — and the subsequent reduction in nutrient, blood flow, and oxygen to affected follicles. There’s evidence that scalp relaxers can help improve blood flow and even lead to signs of regrowth. The challenge is in finding a solution that works for 100% of people, 100% of the time. We aren’t yet there, but we’re getting close. And the mechanical stimulation exercises in the book — coupled with 1) dietary/lifestyle changes to optimize hormonal balance and reduce cortisol, and 2) supplements/topicals that help attenuate certain signaling proteins that contribute to pattern hair loss / calcification / fibrosis — seems to be the best path forward (at least for those trying to avoid finasteride and other hair loss drugs). thank you for comprehensive articles. I started to take 200ug of vitamin K2. As far as I understood, vK2 ensures that calcium is being build up on bones and teeth instead of soft tissue. What exactly can one do to remove the present calcification of the scalp effectively? I’ve read in a german forum, that magnesium oil (chloride) barely penetrates the skin due to its molecular size. Yet, magnesium seems to a great remedy to calcium build-up. Again, I appreciate your inputs a lot! Thanks for reaching out. Research shows that diet, lifestyle changes, and even drugs are limited to preventing calcification and fibrosis — but not necessarily reversing it. However, mechanical stimulation (in the form of massaging, dermarolling, stretching, etc.) has been shown to reverse fibrosis. Magnesium oil has been around for years — and while a lot of science supports the idea that both magnesium and K2 can molecularly prevent or even fight off calcification — we just haven’t seen the results yet for readers. This leads me to believe that while there’s no harm in using magnesium oil, it’s limited in its efficacy as a hair regrowth topical. Hey Brian — it depends on what kind of hair loss to which you’re referring. In cases of female androgenic alopecia, hair thins in a horseshoe pattern but also thins below the ears and even at the nape of the neck. In cases of age-related thinning (outside of male and female pattern hair loss), the hair thins everywhere for both men and women. If we partly believe in skull expansion theory, when due to calcification, head bones, mostly bone in forehead grows, and it says that calcium is in bones. What would happend if we cut out diary, milk, cheeses…etc from our diet. Could it happend to reducing head bones, forehead to normal? Does DHT have a life time or does it adhere to the hair follicles for the whole life span? DHT tends to increases in sites of inflammation and typically decreases as inflammation subsides. So if you remove the inflammation that leads to elevated DHT at certain hair follicle sites, you can likely decrease the DHT there as well. So once DHT binds to a follicle site, it shouldn’t stay there forever. I’m a big believer in the skull expansion theory. I will now try to address what you claim to be shortcomings of that theory..
>What specific cases are you referring to? Could you show me a case where a person experienced frontal bossing where hair grows, after adulthood? In the picture you presented it seems like the man has only experienced frontal bossing at the brow line, like you say yourself. How ever there doesn’t grow any hair there? Am I missing something? “””Not all people with frontal bossing or forehead protrusion experience hair loss. >Isn’t it entirely possible that a person with acromegaly could experience growth spurt in, let’s say, the brow ridge, the hands or and/or the feet but not in, let’s say, the frontal and parietal eminences (where, according to the skull expansion theory the growth of the skull should take place)? So in the case of both Andre and the other guy you showed a picture of, it could just well be that they didn’t experience any growth in the frontal and parietal eminences. By the way both Andre and the other guy have quite a typical head shape for someone who should not lose much, if any hair (for example it seems they both have a flat broad forehead with a (very important) large “middle flat area” (if you don’t know what I’m talking about then I guess you need to read the book from Paul Taylor again). “””There are also cases of men whose skulls haven’t expanded much but have still gone bald. >Well, first of all Paul Taylor stated in his book that one only needs to experience a very small skull expansion for it to cause hair loss. So it might simply be hard to see in the case of Kelly. >Alright.. well that is something I can’t seem to find an answer too.. yet. Haven’t looked into it carefully. Thanks for reaching out. I actually just revised some of my opinions about the skull expansion theory — and mainly around the mechanisms of action by which it might promote the pattern of hair loss — along with the differences between male and female pattern hair loss progression. Rather than reduced blood flow as an immediate consequence of skull bone growth, I think it’s more likely that skull bone growth may partially contribute to chronic tension in the galea aponeurotica, which then transmits to the hair follicles and causes the inflammatory cascade that eventually leads to fibrosis and calcification — which reduces blood flow, then leads to baldness. Great work as always Rob ! Hey, as more of a contributor toward the things you have spoken about here, I think Adrenal Fatigue is something that may be contributing to many peoples hair loss and is highly over looked. Stress, high sugar, low exercise or too much hard exercise, poor diet, high stimulant use, poor sleep and all the other things that come with it. Possibly, chronic stress is literally a killer, first showing its ugly head with with hair loss. I have a very strong feeling that if someone has hair loss and adrenal fatigue, the fight cannot be won. Life needs to becomes stabilized first, then results can happen. Thanks for the kind words. And there are certainly a variety of pathways where adrenal fatigue — or now called “adrenal dysregulation” — can contribute to AGA. I’ll try to get an article out about this by the end of the year. And thanks again for reading! Rob this is pure light ,of all the hairloss theories i have come across to yours seems dominant .! There are many anatomical differences between male skull and female skull. Maybe this is enough to explain the pattern of female baldness using the muscular tension / tight Galea theory. I’d like to know your opinion about my observation. Secondly, with two-dimensional Von Mises models, when we map the galea aponeurotica by its connective points to muscles and simulate contraction, we can reproduce a tension pattern that nearly exactly matches that of AGA progression. Interestingly, when we do this with a reduced head model size, we get equal tension that matches the diffuse thinning pattern to which most women suffer. Without more information, we can’t say exactly what’s going on. But I’m certainly in agreement that skull shape and muscle size / placement differences in males versus females could explain the difference in the patterning of hair loss. As you can see in this video https://youtu.be/DZWUAJJ0P-U, the skull is quite different, especially in the front/ vertex and sides. Haven’t seen anything linked to this article yet so I’ll leave it here. Made me stop and think about it a good bit. This guy tells hairloss happens due to raising of eyebrows!! Whay do you think about?